Now, 100 years later and after a century of standardisation, we find our beloved Serial Digital Interface being replaced or augmented by (?) Internet Protocol (IP) transport. We find that the concept of black & burst timing synchronisation doesn't fit well with the concepts of IP. The prospects of synchronising pictures and sound recorded separately with a wide variety of frame rates and sample rates which in turn might be independently delivered via stream, file, point-to-point link or packetized network, have moved us full circle to "Needing a standard to sort this out". These requirements all seem sensible. Requirement #1 implies that it should be easy enough to understand and implement - no complaints there. Requirement #2 is pretty straightforward as well. Timecode currently satisfies requirement #2, so if we're going to replace it then it would seem sensible to be able to use old content on a new system. Requirement #3 also appears pretty sensible. We are beginning to see cinema content at 120 frames/sec. We are seeing TV content between 24 frames/sec and 300 frames/sec . Varispeed content could be shot at any framerate. Wouldn't it be nice to be able to independently set up the camera and a separate sound recording device for object based (immersive) audio and have them magically synchronise themselves without a complicated setup procedure? Unfortunately, without limiting the ranges of frame rates and sample rates, you can't do it and still have a generally applicable and SIMPLE standard. 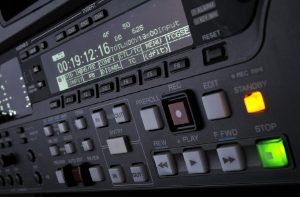 So what are the standards bodies, like SMPTE, actually doing? There has been a significant body of work recently completed that maps many of the new, standardised frame rates and resolutions to 3G, 6G and 12G SDI links. There has also been a great deal of work mapping these same formats to IP links. There are groups like the Alliance for IP Media Solutions (AIMS) who are working through the practical realities of making IP links work as well as the Advanced Media Workflow Association's (AMWA's) Networked Media Open Specifications (NMOS) group that is delivering code and procedures for registering, discovering and connecting to IP devices. None of these initiatives are actually concerned with the core subject of synchronisation. For that, we need to look at the core SMPTE ST 2059 standard. This standard uses Precision Time Protocol (PTP) to distribute a time signal around a network so that independent devices can recover the same clock and know what the local time is to great accuracy. The system work by sending messages between nodes and measuring delays using local and remote clock references. To build a complete system, legacy timing signals need to be created from the new timing source. Part 1 of the specification (SMPTE ST 2059-1 Generation and Alignment of Interface Signals to the SMPTE Epoch) allows this backwards compatibility to be achieved.